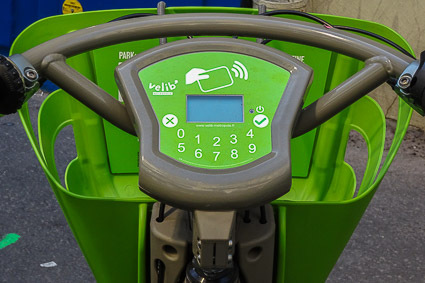 The city's reminted Vélib' Métropole bike-sharing program offers nearly 15,000 "hop on, drop off" mechanical bicycles and e-bikes at rockbottom rates. ABOVE: Vélib' bicycles for hire. Paris was one of the first major cities to jump aboard the bike-sharing bandwagon, and its Vélib' program (now called Vélib' Metropole) has become a part of everyday life for many Parisians since it was introduced in 2007. Today, Vélib' Métropole has approximately 15,000 bicycles at more than 1,200 stations. The program has had its glitches and growing pains over the years--most recently, in 2018--but it still has almost 200,000 subscribers, and new technologies such as e-bikes and phone apps continue to make Vélib' attractive to locals and visitors alike. For short visits, you have two options: A one-day "V-Découverte" pass or a seven-day "V-Séjour" pass. You can use the card to borrow up to five bikes at one time, which means you'll need only one pass for a family or small group. You can pick up a green mechanical bike or a blue e-bike at any Vélib' station and return it at any other. The first 30 minutes of use are free for mechanical bikes, with a tiny fee for electric bikes. You'll also pay a small amount for longer rides. Choose any bicycle in the rack. Click the "Enter" (checkmark) icon on the bike's dashboard to activate the electronic reader. Swipe your card against the scanning area above the screen. Enter your 8-character access code. Swipe your card again to unlock the bike. Remove the bike from its parking slot and pedal away. Click the checkmark icon on the bike's dashboard. Swipe your card to unlock the bike. If you're in Paris for an extended stay, consider one of the program's annual subscription plans. Are you already a customer of an international "station-free" bicycle network? 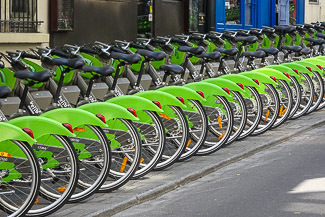 See our article on Paris bike-sharing programs. For more information about the Vélib' program in English, visit the multilingual Vélib' Métropole Web site.